Miami-bred entertainer Flo Rida has ascended to platinum status – but he’s never forgotten his training roots. Previous story M&F Clip of The Day: The Quotable Arnold Next story M&F Clip of The Day: Benedikt Magnusson's 1100 Tire Deadlift WORLD RECORD! Dillard is up at one o’clock in the morning doing 500 dips on his balcony where the railing forms a V shape. Sometimes he does 300 pushups when everyone else is asleep so that he can “be more advanced and look more swole the next day.” The daily workouts after school at Miami Carol City High—all the squats, pullups, and weighted dips with a 45?pound plate dangling from his waist— aren’t enough. 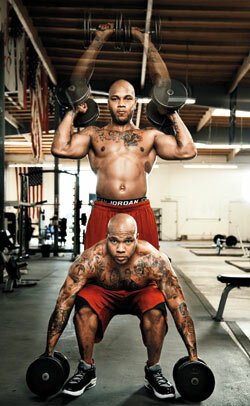 Dillard has to be stronger than his friends, has to be able to bang out more pushups than them at a moment’s notice. He has to make that first bench?press workout a forgotten memory. If you think every kid growing up in the projects is up to no good, note that Dillard was an exception. Between endless hours spent making music with his rap group, The GroundHoggz, lifting weights obsessively, and playing basketball for the Miami Carol City team, he was mostly able to dodge the improprieties that plagued so many of his peers on 187th Street, a rough area Flo describes as “the bottom of the slums” in his landmark 2009 release R.O.O.T.S. (an acronym for Route of Over? coming the Struggle). His music and his training, especially the former, served as cocoons that shielded him from the gunshots piercing his apartment complex, the SWAT officers camping out on the roof overhead, and drug dealers looking for someone to help them stash their cocaine.